On this day upon your arrival in the city special pickup facility will be arranged for the travelers and you will be made to stay the hotel. In the evening you can go out for a walk. Overnight stay at hotel. After the stop at beautiful Pocono Mountains we will get headed towards Niagara Walls where the rainbow bridge will provide the spectacular view. The shores of the finger lake will provide an amazing view at the Seneca Falls. A local travel guide will be provided who knows many languages. On this day departures will take place. Local transport services will be arranged for drop from the hotel to the airport. Niagara Waterfalls is the name given to the three waterfalls straddling between the city of New York and Canada. It is basically situated in the Ontario city of Canada and is connected to New York with rainbow Bridge. Planning a weekend holiday in Niagara Falls will fill you with a new energy and enthusiasm. 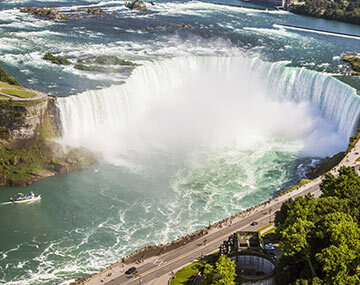 We are providing the 3-Day Niagara fall holiday package at affordable price and with all the facilities so that all you have to do is to book the package and sit back and relax as we will take care of your each and every need. You can even book customized Niagara falls weekend getaway packages with us. All rates or fares are subjected to change at the time of booking. Booking amount is per person. We reserve the right to change the accommodation due to unavailability of rooms or other reasons. We do not hold any responsibilities for the delay or cancellation of flights. Due to Weather conditions, War, Natural Calamities and circumstances beyond control etc., the Tours will be cancelled or postponed. We will not bear any extra charges due to tickets. We do not hold any responsibility to bear the charges due to any extra baggage that can be levied by airlines. For any of the optional services, you have to pay on your own. Oh my God The beautiful view of Niagara fall was unforgettable and i cannot express in words it was too good. Thank You so much Bookotrip .